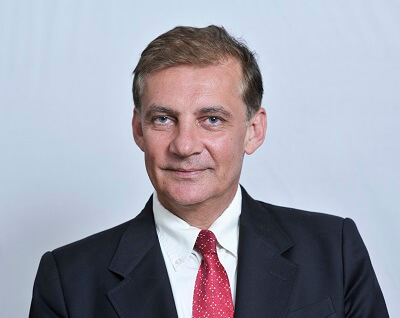 Meletios A. Dimopoulos, MD is Professor and Chairman of the Department of Clinical Therapeutics at the National and Kapodistrian University of Athens School of Medicine, Athens, Greece. He has been elected Vice Dean of the Medical School for the academic years 2007-2011 and Dean for the academic years 2011-2015. In February 2015 he was elected Rector of the National and Kapodistrian University of Athens for a 4 year term. He obtained his medical degree from the National and Kapodistrian University of Athens in 1985, completed a residency in internal medicine at the Royal Victoria Hospital, McGill University, Montreal, Canada and a fellowship in hematology/oncology at the University of Texas M.D. Anderson Cancer Center, Houston, Texas, USA. Dr. Dimopoulos is a member of numerous scientific societies and has authored more than 750 publications (November 2015) in peer-reviewed journals, as well as numerous abstracts and several textbook chapters primarily focusing on plasma cell dyscrasias and genitourinary and gynecologic cancers. He has more than 26000 citations and his h-index is 78 (ISI-Web of Science). He is a journal reviewer for several journals including New England Journal of Medicine, Blood, Journal of Clinical Oncology, Haematologica, Leukemia, Cancer, European Journal of Haematology, Leukemia and Lymphoma etc. Dr. Dimopoulos was Associate Editor of the European Journal of Internal Medicine (2001-2007), is an Associate Editor of Current Hematologic Malignancy Reports and is an Editorial Board Member of the Journal of Clinical Oncology (2005-2008), of Haematologica, of Leukemia and Lymphoma, of Clinical Lymphoma and Myeloma and of Expert Review of Hematology. Dr. Dimopoulos serves on the Scientific Advisory Boards of the International Myeloma Foundation, of the International Waldenstrom’s Macroglobulinemia Foundation and he is a member of the Board of the European Myeloma Network. Dr. Dimopoulos organized the XIth International Myeloma Workshop and the IVrth International Workshop on Waldenstrom’s Macroglobulinemia (Kos Island, Greece June 2007). In March 2013 Dr. Dimopoulos was elected as a member of the Board of the International Myeloma Society. He is a recipient of the Robert A. Kyle Award for outstanding contributions to Waldenstrom’s macroglobulinemia.